Bread Snack Recipes. Bread Recipes. Nothing can beat the aroma and flavour of warm, freshly-baked bread, especially when it is made at home. There is an added advantage to making your own bread – you know that it is 100% safe. From everyday loaves like Basic White Bread Loaf and Brown Bread to artisan loaves like Homemade Soft French Bread and Cheesy Garlic Pull-Apart French Bread, you will find several options to pick from. 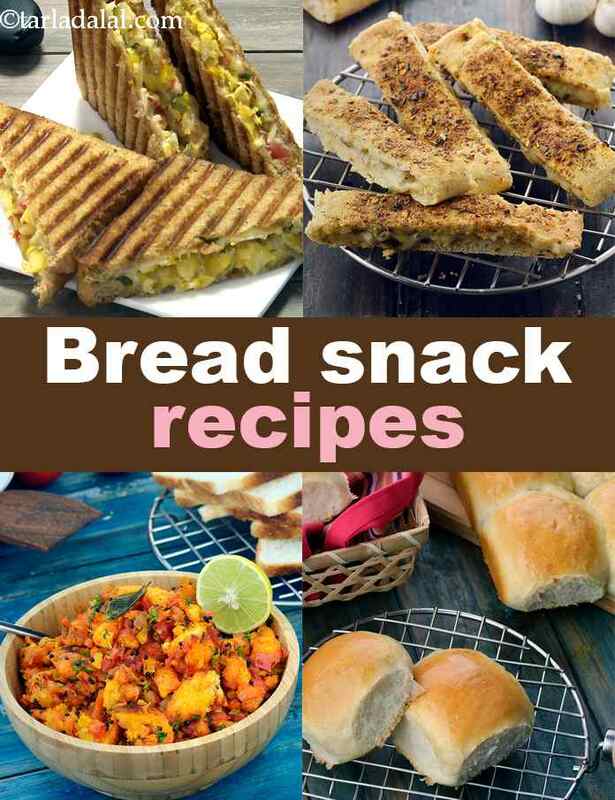 This section also includes many delicious recipes made with bread like Bread Upma and Herb Bread. Ladi pav, a quintessential component of an array of dishes like vada pav, bhajji pav, pav bhaji, samosa pav is an Indian bun made with just a handful of ingredients. You can simply perk them up to make Ladi Pav Garlic Bread by applying delicious garlic-butter and baking it. Just like roti is to Indian cuisine, bread is to Italian. Their meals are incomplete without freshly baked bread like the Brioche Loaf, Homemade Soft French Bread, Sourdough Bread or the Baguette. Focaccia Bread, Stuffed Cheesy Garlic Bread, Dinner Rolls are bread variations perked up with herbs and spices. Serve them as an appetizer or along with soups and pasta. While readymade burger buns, pizza base, hot dog rolls are easily available in the market, you can also make them at home, after all, the fresh taste and texture of a homemade one are unbeatable. Load it with different sauces, stuffing, cheese and other toppings to create a myriad of snacks at home. Health conscious people can replace refined flour in certain bread recipes with whole wheat flour or healthy substitutes like millet flours, jowar and rajgira flour, oats etc. Whole Wheat Ladi Pav can become a healthy accompaniment to spicy bhaji and vegetable curry. Similarly, you can make whole wheat burger bun or whole wheat hotdog roll to make healthy snacks at home. Some bread loaves are dense while some are crusty outside and soft inside, just slice them up and spread your favourite jam or spread on! Multigrain Bread, Buckwheat and Quinoa Bread are healthy alternatives to make sumptuous sandwiches. Almond Bread, Coconut Flour Bread, Rice Flour Bread are gluten-free, which means that even gluten-sensitive people can enjoy it. You can relish them plain, toasted or grilled. Dab some butter and jam on it and enjoy! Bread is versatile and I am sure you won’t be amazed by the number of snacks you can prepare using it. From wholesome breakfast to tempting appetizers, bread can be used to prepare a myriad of dishes. Kick-start your morning with this chatpata Bread Upma made using just a handful of ingredients. Who doesn’t like pizza? How about transforming them into delightful, unique snacks like the Pizza Burger Bowl, Pizza Puff or a quick and easy Bread Pizza recipe. Also, you can check out other appetizing dishes like garlic bread recipe, bread pakora recipe and bread roll recipe on our website. Hope you enjoyed our collection of 124 bread snack recipes.